The property for the park’s ballfield that borders Court Street was acquired by the Parks Department on June 3, 1953. 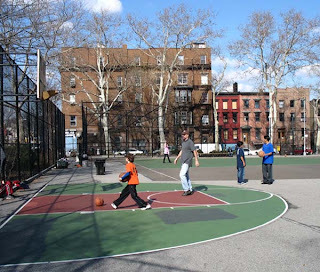 The playground was first built in 1957 and was renamed “Louis Valentino Jr. Ballfield” under a local law introduced by Councilmember Stephen DiBrienza and signed by Mayor Rudy Giuliani on June 25, 1996. On February 5, 1996, Valentino, who grew up in Red Hook, was killed while searching for wounded firefighters in a three-alarm blaze in an illegal Flatlands garage. In 1999, Councilmember DiBrienza allotted $603,773 to refurbish the .90-acre ballfield. 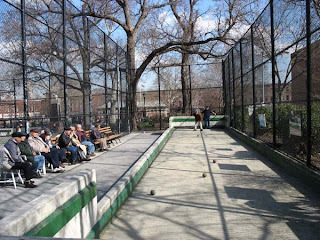 The scope of the renovation included paving the park’s field with new asphalt, chain link fencing, single and double gates, benches, new baseball, basketball, and bocce recreational facilities. In addition, the existing perimeter landscape was enhanced with additional plant material to create a grove and community garden.